Former piano prodigy Nastya Kashnikov wants two things: to get through high school without anyone learning about her past and to make the boy who took everything from her – her identity, her spirit, her will to live – pay. Josh Bennett’s story is no secret: Every person he loves has been taken from his life until, at 17 years old, there is no one left. Now all he wants is be left aloneand people allow it because when your name is synonymous with death, everyone tends to give you your space. Everyone except Nastya, the mysterious new girl at school who starts showing up and won’t go away until she’s insinuated herself into every aspect of his life. But the more he gets to know her, the more of an enigma she becomes. As their relationship intensifies and the unanswered questions begin to pile up, he starts to wonder if he will ever learn the secrets she’s been hiding – or if he even wants to. Two points of view, two broken hearts, and a good author to tell their story. 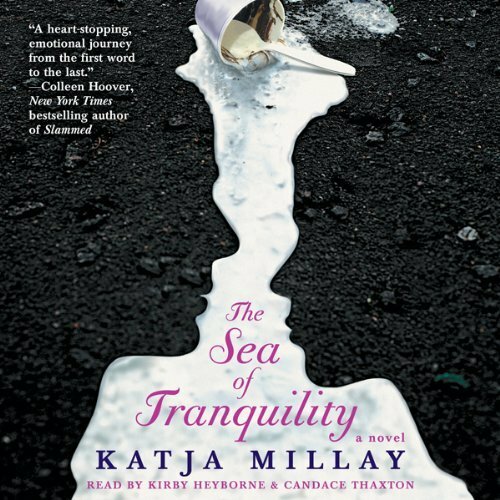 The Sea of Tranquility audiobook is the debut novel of the self published author Katja Millay, and one hell of a debut I might add. Two damaged souls need to be put together again, and love will do just that, and while the journey is breathtaking, engrossing, anxious and at times painful, it’s ultimately, uplifting. My heart hasn’t been touched this way in a long time. Nastya and Josh have experienced events that have left them incredibly defensive of their hearts, and they both have formed a shield to protect themselves from further pain; they are determined to keep things that way. But faith has other plans, and when Nastya moves into Josh’s high-school, he won’t be able to ignore the new girl all dressed in black, red light district lipstick and signature stilettos. At the same time, Nastya’s curiosity will picked when she meets the boy who crafts beautiful wood furniture with his bare hands and doesn’t seem to have time for anyone. Katja Millay crafted two characters that will steal your heart; they make you experience their emotions with heartfelt intensity from their authenticity and credibility. I loved how the protagonist’s relationship was slow to developed, and just the same way the LOVE slowly crawled into each-other’s hearts, it also crawled into mine, and before I knew it I was in-love with these two characters and their story. There are so many things I loved about this book! Besides how beautifully the characters and their story were developed; I also loved how the author slowly revealed what happened to Josh and Nastya that shaped their current attitudes, I really enjoyed the secondary characters, but most of all, I loved how easily the author’s voice pulls you into her story and manages to keep the plot fresh, original and captivating, regardless of being written about attitudes the might be considered cliche. This is a story about the healing powers of love and its ability to pull anyone from the darkness. If you enjoy YA and NA novels, I highly recommend The Sea of Tranquility audiobook, a lovely story, beautifully told. I loved how Candace Thaxton didn’t miss any of Nastya’s personality features; she was defiant when she needed to be (without sounding spoiled), yet sweet and vulnerable when the story demanded it. She also does a good job with the male roles – I didn’t feel the story choppy in any way when the point of view switched to back to Josh. Kirby Heyborne also does impressive work with Josh’s point of view, and equally as good as his partner, he does a good job with the female voices and their tone. They both do a tremendous job transmitting to listener the heartfelt emotions and the ups and downs of the novel’s mood. This is an excellent performance by these 2 narrators. I’m looking forward to enjoying a lot more of their work.